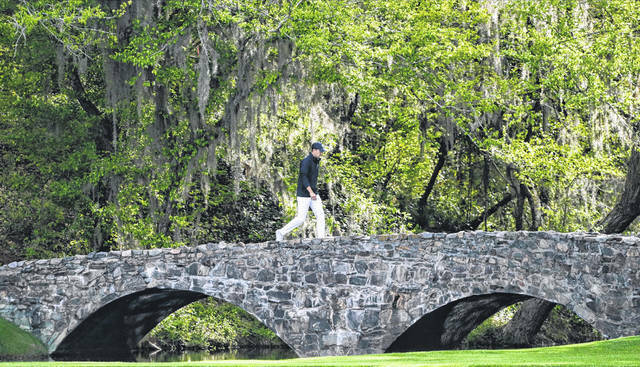 Jordan Spieth walks across the Nelson Bridge on the 13th hole during the fourth round at the Masters golf tournament in 2018. Spieth has been in the Sunday mix at all five Masters he has played. AUGUSTA, Ga. — The not-quite-ready-for-prime-time Thanksgiving exhibition with Tiger Woods and Phil Mickelson produced such bad golf that Mickelson and country singer Jake Owen traded barbs about it a day later at Jordan Spieth’s wedding. Still, the defending champion is rarely the focus and for the most part the big names in the game aren’t either. The course is the star, even when the real tournament begins — as is Masters lore — on the back nine on Sunday. Then again, Woods hasn’t won a Masters in 14 years, and Mickelson is almost a decade removed from his last green jacket. https://www.limaohio.com/wp-content/uploads/sites/54/2019/04/web1_Augusta.jpgJordan Spieth walks across the Nelson Bridge on the 13th hole during the fourth round at the Masters golf tournament in 2018. Spieth has been in the Sunday mix at all five Masters he has played.